International wagering company 'The Stars Group' made the move to acquire both the Australian branch of William Hill as well as CrownBet early in 2018 with the intention of merging the two to rebrand the formely popular Australian company SportingBet. However, in late July of 2018 it was announced that the two massive Australian betting companies would in fact be merging to recreate the 'BetEasy' brand, which was the original version of CrownBet. BetEasy launched in August of 2018 and seemlessly transferred all William Hill and CrownBet members into one easy to use 'BetEasy' account. We take a look at the BetEasy website and it's features and promotions in our full review below. In the transition from the days of Crown Resorts owning and operating CrownBet to the newly formatted BetEasy, one important feature that members have lost is the ability to use their Crown rewards points at Crown resorts itself. 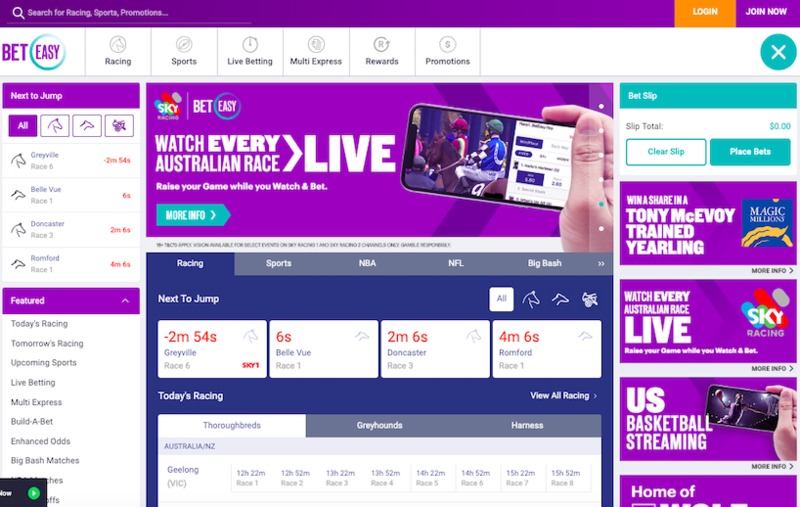 In terms of the actual layout and betting interface, BetEasy has kept a similar design to the old CrownBet with some improvements. BetEasy is quite a simple and effective layout to use and makes it easy enough for punters to place a bet on whatever market they want. As you can see in the image above, BetEasy utilises a two-menu system, with quick links and account info on the top menu and left menu featuring all the detail information about betting markets. Once the markets on the left are clicked, more info appears in the middle of the screen, while the betting slip is featured on the far right. This is a very familiar layout and makes BetEasy, like the names suggests, quite easy to use. Like many Australian sports betting sites, BetEasy seem to have plenty of focus on horse racing and related betting, though there is still enough of a focus on general sports betting markets to please everyone. Another key feature that will disappear with the rebranding of BetEasy, however, is the ability to watch live AFL games through the CrownBet app, which is unfortunate. CrownBet recently announced a partnership with SkyRacing, and for the moment it looks like this feature will transfer over to BetEasy, meaning that all BetEasy members can now view both Sky Racing channels on their computer, phone or tablet! BetEasy has recently replaced their old rewards system with a new one titled 'My Rewards'. My Rewards is your personalized section of the BetEasy website and app where you will enjoy enhanced daily promotions and offers. New rewards include Bet Return specials (eg. Run 2nd/3rd) to use on the races you choose, Bet Boosts and Multi Boosts as well as eligible Deposit Offers and Bonus Bets. If you don't have a BetEasy account, click here to sign-up to BetEasy today throught Before You Bet and score a 400% bonus up to $200! That's right, if you deposit $50, you'll receive the another $200 bonus on top to bet with! Normally, this bonus is only 100%, but for a limited time only, we're able to offer BYB customers an exclusive bonus of up to $200! But hurry, as this offer won't last long! To take advantage of the full sign-up offer, customers must create a new account using the links here at Before You Bet and make a $50 deposit - you will then receive the $200 in bonus bets meaning you have a total of $250 to bet with!! BetEasy T&Cs apply. New Customers Only. Excludes residents of VIC, NSW, WA and SA. 18+.